Photography Writ Large: The Monumental Art Of Thomas Struth Struth is known for massive pictures of architecture and people looking at art in museums. 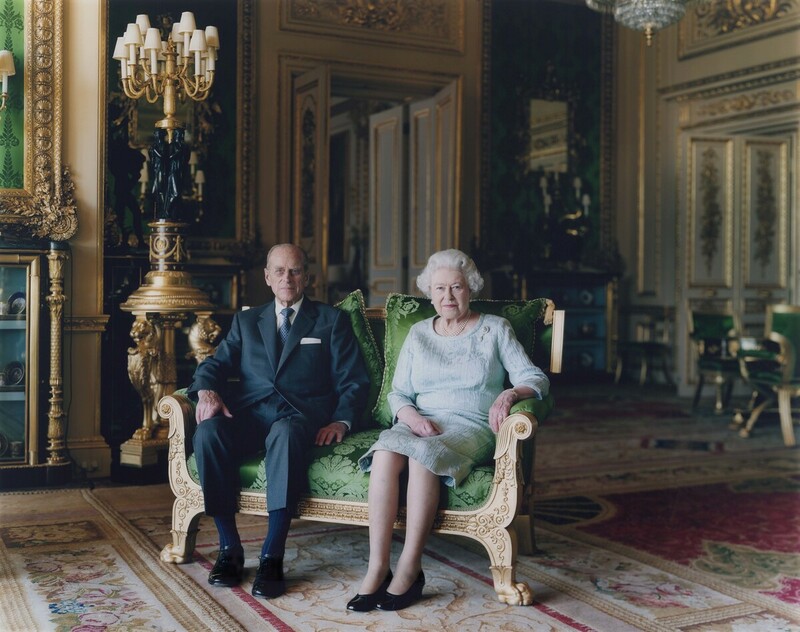 But a few years ago, a commission to photograph the British royals pushed him out of his comfort zone. 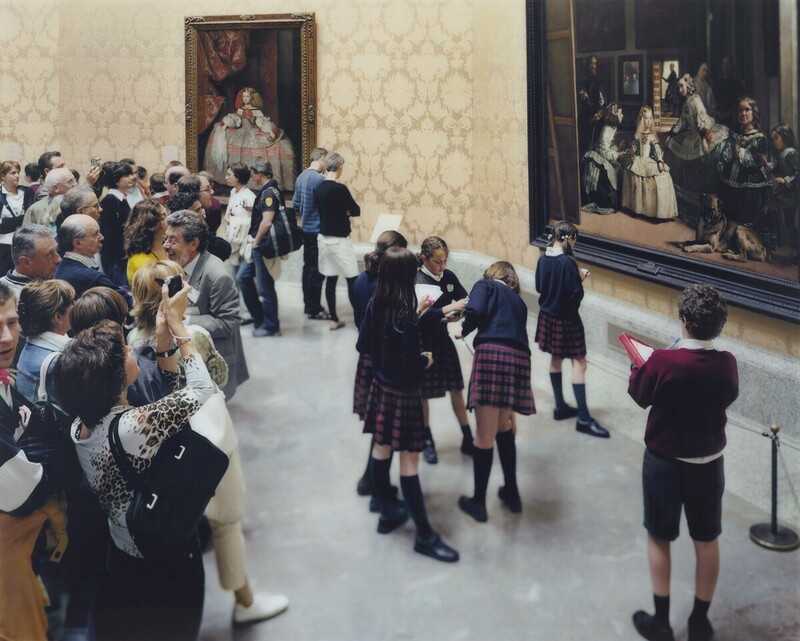 Thomas Struth is known for large photographs of people looking at paintings, sculptures and art in museums. In Museo del Prado 7, Madrid 2005, a school group sketches Diego Velazquez's Las Meninas. A big blue rooster has appeared on top of the National Gallery of Art in Washington, D.C. It's part of the museum's renovated East Building, which recently opened to the public with several new exhibitions — including a handful of pictures by the highly regarded German art photographer Thomas Struth. The pictures belong to Robert Meyerhoff and Rheda Becker, a couple who began collecting photographs nine years ago. Their very first purchase — Struth's Alte Pinakothek, Self-Portrait, Munich 2000 -- is now hanging in an East Building gallery. In it, Struth is seen out of focus and from behind, inspecting a self-portrait by German Renaissance painter Albrecht Dürer. Struth shot the photo so that Dürer's painting looks life-size. Albrecht Durer painted his self-portrait in 1500, so Struth's Alte Pinakothek, Self-Portrait, Munich 2000 feels like a conversation between artists across 500 years. Becker always loved Dürer's self-portrait. She says that when she saw Struth's double self-portrait, "I was so fascinated by the idea that someone was doing what I had just done. 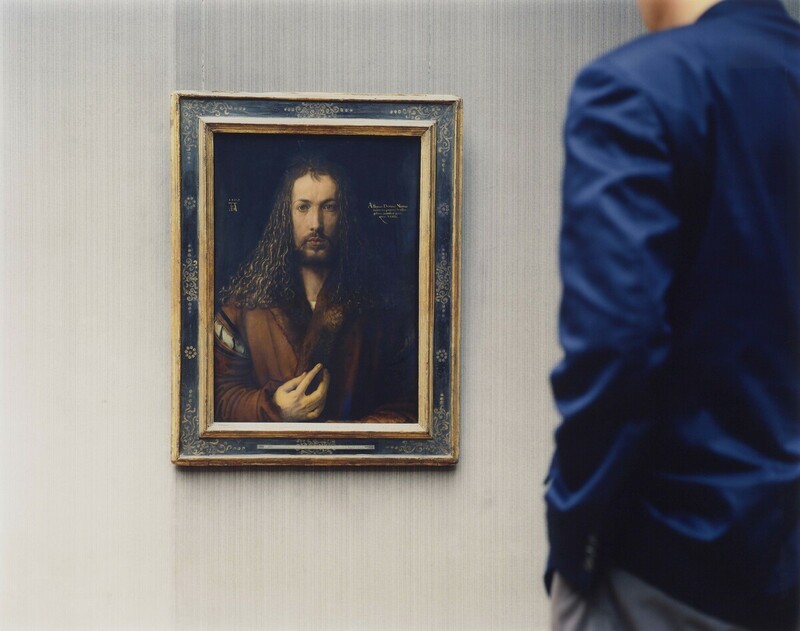 This wasn't a photograph of the Dürer; it was a photograph of ... someone looking at a great work of art." She shared the experience with Meyerhoff, who was already a major collector. As Becker remembers it, "[He] was the one who said, 'It would be fun to see if we could get that.' "
Struth is known for large pictures of people looking at paintings, sculptures and art in museums. He also makes massive architectural images. 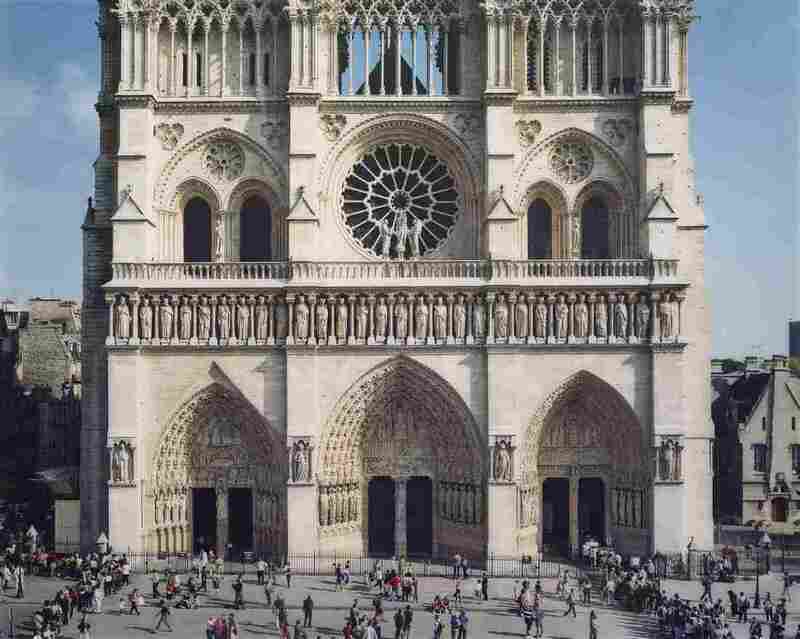 His photo of the facade of Notre Dame — part of the Meyerhoff-Becker collection — is 6 feet by 8 feet, the largest photographic paper Kodak makes. In it, the looming cathedral fills the photo space, and visitors below are as small as the sculptures that adorn it. It's as if the photo was taken from the high window of a tall building across the way — but there's no tall building there. For the elevated, head-on perspective he wanted, the photographer needed a place to stand with his big, 8-by-10-view camera. So he ordered a very tall, moveable platform. "It came on a gigantic truck on a Saturday morning at 7 o'clock," Struth says. He had to remove the platform every evening, and take it back to the front of the cathedral every morning. He also had to ask a souvenir hawker to move his wares so as not to get in the picture. "He said, 'Well that makes like 500 euros less profit on one day,' " Struth remembers. "So we paid him some money to move it." Tourists appear to be the same size as the sculptures that adorn the cathedral in Struth's Notre Dame, Paris 2000. The photographer then waited for just the right number of tourists to walk by. In the enormous photo, not one tourist is blurred. It took two days to get the image he wanted — some 120 shots. Struth spent considerably less time making another photo in the Meyerhoff-Becker collection. It's very different from his architectural and museum work, and much less dramatic. A curator at the National Gallery in London wanted to commission him to photograph Britain's Queen Elizabeth and Prince Philip. It wasn't exactly his style, so the photographer spent days making pro and con lists. Con: He could fail, and that would be bad. Pro (but also sort of con): "If it succeeds, then I have to talk about it all the time," he says. So Struth set some conditions. First, he would pick the dress — nothing fancy, no fur-trimmed robe, no crown. He chose a simple pale blue, silk dress, a small pin on the shoulder and black patent pumps. Three weeks before the shoot, he scoped out Windsor Castle and picked a room with gold trim, chandeliers and a rich green brocaded love seat that he angled back so a bright natural light made the queen more prominent. The royals sit facing the camera. Her expression is pleasant; his stare is intent. "He's like an old eagle," Struth says of Prince Philip. Struth took 17 photographs in 25 minutes. "They were actually quite nice together," the photographer recalls. "While I was dealing with the camera and stuff like that in between, they were talking to one another and I thought, They're great. I like them." To collectors Meyerhoff and Becker, they look like a fairly ordinary suburban couple in a fancy room — the kind of couple you could have "over for a Johnny Walker Black." In addition to Struth's work, Rheda Becker and Robert Meyerhoff's photography collection includes pieces by Cindy Sherman, Jeff Wall, Catherine Opie and John Baldessari. All those contemporary photographers, and more, are on display in the East Building of the National Gallery of Art until early March.